The AMR Industry Alliance brings together over 100 biotech, diagnostics, generics and research-based pharmaceutical companies and associations, to drive and measure the life-sciences’ industry progress to curb antimicrobial resistance. 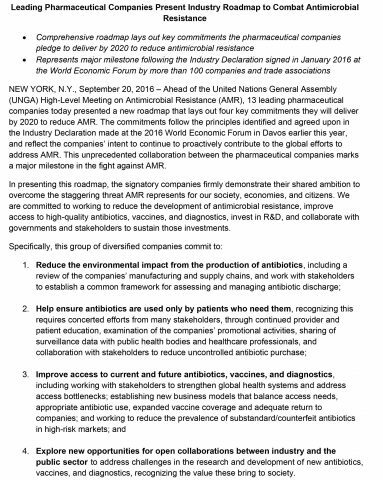 The AMR Industry Alliance ensures that signatories collectively deliver on the specific commitments made in the Declaration (January 2016) and the Roadmap (September 2016) and measures industry’s progress in the fight against antimicrobial resistance. 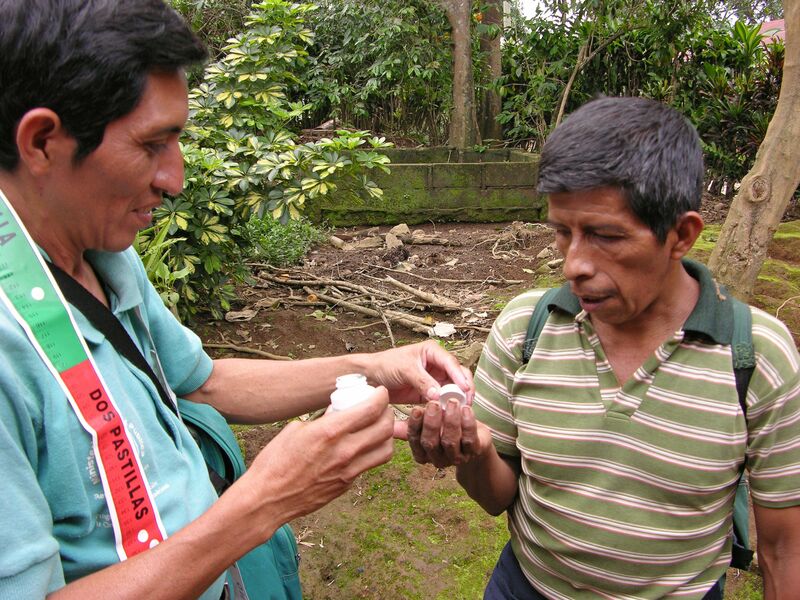 Today, an estimated 700,000 people die each year because of the growing number of potentially deadly infectious pathogens, including those that cause tuberculosis, HIV, malaria and staph infections, that have developed resistance to treatment regimens. 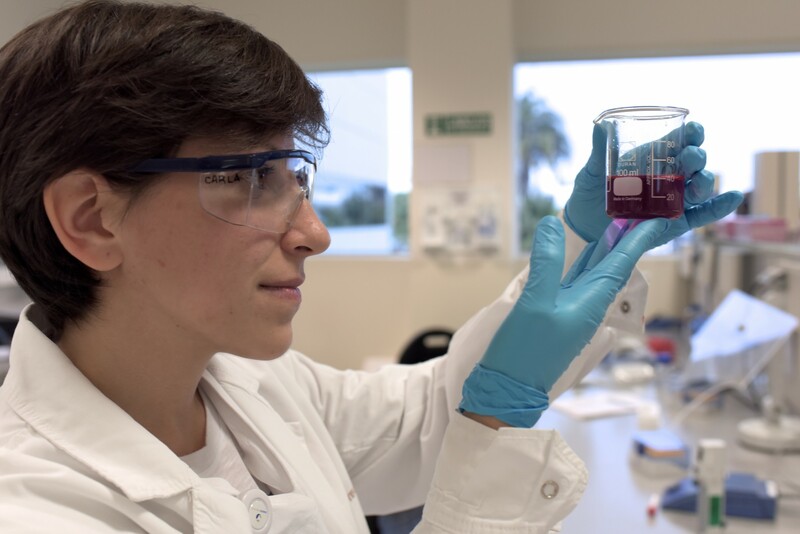 In response to this public health threat that has the potential to turn the clock back on modern medicine and the social and economic consequences associated with it, the United Nations called in 2016 for concerted action from governments and various sectors, to address the implications of antimicrobial resistance. The AMR Industry Alliance is the life sciences industry’s response to call for action. 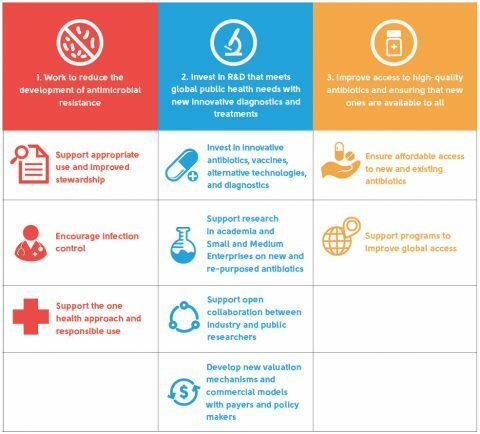 In an unprecedented effort, over 100 companies and associations signed the Industry Declaration on AMR at the World Economic Forum in Davos in 2016, followed by the adoption of a Roadmap, outlining a common set of principles for global action that focuses on investing in R&D to meet public health needs, reducing the development of antimicrobial resistance, improving access to antibiotics, vaccines and diagnostics, and reducing the environmental impact of manufacturing. 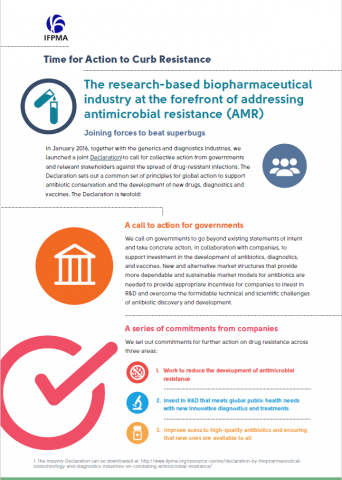 The AMR Industry Alliance launched its first Progress Report on 18 January 2018 (see Press Release here). 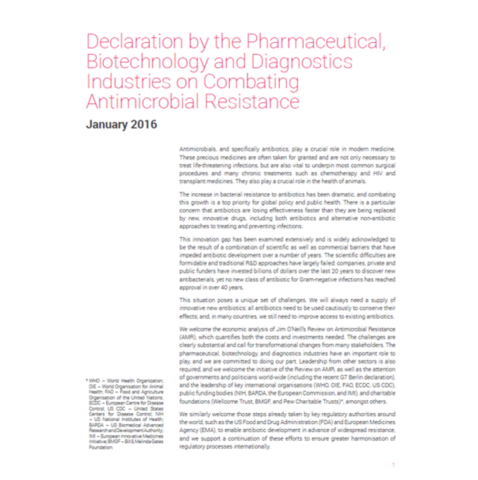 This report shows the commitment of the life sciences industry to tackle the public health threat of antimicrobial resistance (AMR). The report was compiled by the consultancy SustainAbility. 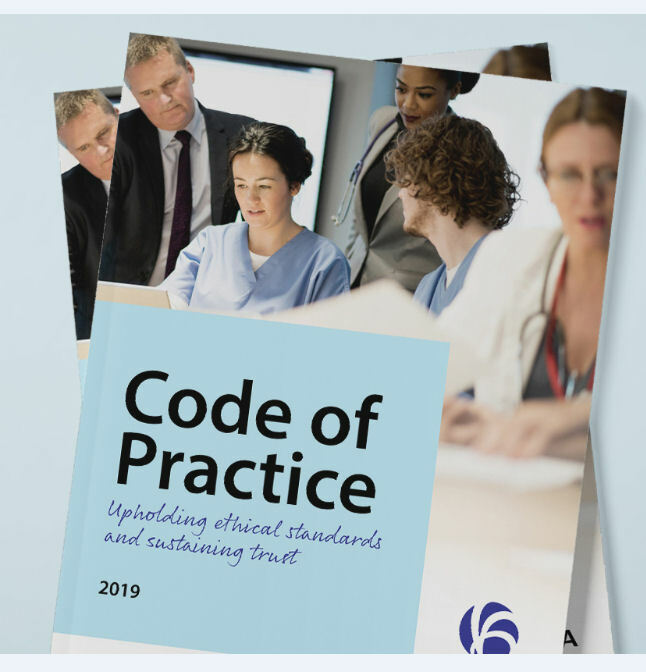 The data and case studies collected in the Alliance report provide unique insights into the practical steps Alliance’s members are taking to respond to AMR in the areas of research and science, access, appropriate use, and the environment. The report presents data on AMR-relevant products, including therapeutic agents or technologies that have the potential to treat or prevent infectious diseases and/or combat resistance, including but not limited to antibiotics, vaccines, diagnostics, and novel approaches to address AMR.